This is the summary of consumer reviews for Royal & Langnickel Deluxe Sketching Artist Box Set. The BoolPool rating for this product is Very Good, with 4.40 stars, and the price range is $25.00-$49.99. 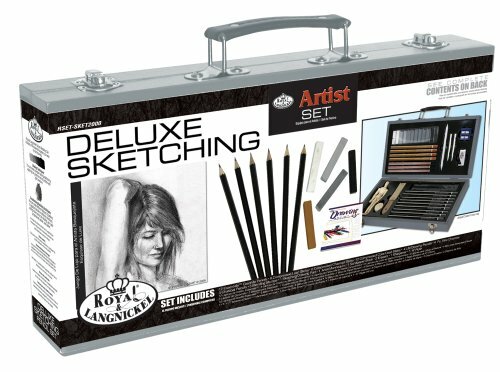 Royal & Langnickel Deluxe Sketching Artist Box Set features a large array of tools for starters to refine sketching and drawing talent. The assortment of all the sketching tools comes nicely and conveniently placed in a wooden carrying case, which makes it easy to carry and/or store away. The set includes graphite pencils, graphite sticks, charcoal sticks, compressed color sticks, pastel colors and other accessories like brushes, stylus, palette, palette knife, drawing pad, mannequin, ruler, sanding block, sharpener, eraser, apron along with a painting guide booklet for watercolors. However, one major concern is sharpening the charcoal pencils, the point repeatedly breaks causing frustration among users. In addition, though the box is sturdy, the hinge is weak. The slots that hold the art supplies is made of plastic and does not hold the items very well, forcing them to fall out of place. 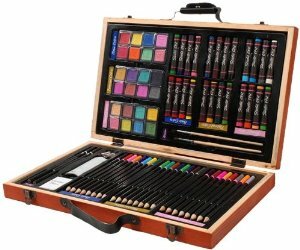 Overall, the Royal & Langnickel Deluxe Sketching Artist Box Set is a good recommendation for art lovers who wish to explore their sketching talent. 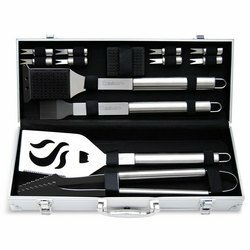 The quality, utility and affordable price makes this set a good one to own. CA PROP 65 WARNING: This product contains a chemical known to the State of California to cause cancer. All the items in the box are wonderful. Im not satisfied with this item because the box of my art supplies is broken when I just open it!. Good sturdy box, the different items that come with it're great and I'd recommend this very much. The quality of the sketching items is good and it'll be fun to dig in and use. I kept trying to close it and had the items falling out of their slots and getting caught between other things. The little plastic thing that the stuff is supposed to 'click' into doesn't hold the items very well. It'll supply the beginner with most everything they need. Not that hard to fix, and maybe this happened durring shipping. The only thing I didn't like are the hinges (weak), but I fixed it. I received the product, it looked nice. This's a pretty nice art box set. A nice, more mature artist's package for a young girl who's blossomed from the kiddy art packs she used to get!. Appears to be a very nice set. I'm very pleased with my purchase and would recommend it to anyone wanting a nice art set. I can't say how nice it's to not carry 10 zip lock bags around looking like a crazy cat lady or drug dealer for art supplies. I don't do this often because I try to be nice, but boy oh boy, avoid this thing like the plague, it'll only hinder your art ability, your wallet, and your sense of faith in art products online. You can get another nice box to put the items in. I contains a good assortment of sketching tools all conveniently arranged in a nice carrying case. Product came as described, the quality of pencils and charcoal are good too. You get different kinds of artistic tools including pencils, pastels and charcoals. The only problems I'd were sharpening the soft charcoal pencil (its point would break each time) and putting the mannequin. Great product, very useful.highly recommend fot people who love to draw.the case is nice and sturdy. 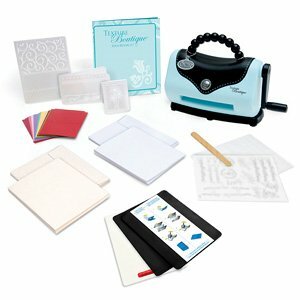 Enjoy the ease, complete little kit for drawing. 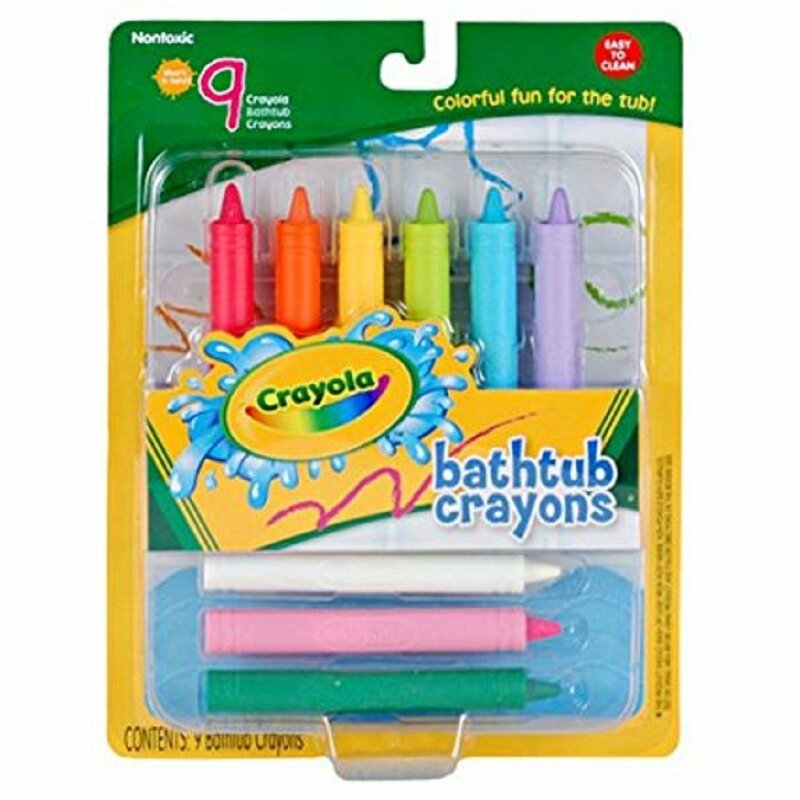 I bought this for my daughter who loves to draw. Everything you need for your basic drawing. This really worked with the drawing book I bought. A lot of good drawing tools. My brother is a great artist who stopped drawing for awhile until I found this box set at Amazon which had everything he needed to start drawing again. Bought this for a friend who's in college for an art major in drawing and he really enjoyed the gift. Also, it's very thrilling to draw with the pencils since you can appreciate the different tones of shades you give to your drawing. My son loves to draw and with this set he's everything he needs.